Does the word make you want to toss your cookies? Much like the dude in this State Farm commercial, you may have sworn you’d never in a million years stoop to the low, low level of minivan–only to realize you’re three kids deep and you need a family vehicle, STAT. Don’t despair. Just because you want to keep your family safe doesn’t mean you’ve sold out. There are loads of used cars in Winnipeg that are spacious, reliable, and economical–and (shocker!) not all of them are minivans. Here’s how to find a family car that doesn’t make you want to hide behind the steering wheel. No two families are alike. Ours is certainly unique. Like, we dress up in chicken suits and sparkly red outfits for fun. Not exactly normal. The number of kids you have: How big of a car are we talking? How old those kids are: Just a baby? You could get away with a car seat-friendly sedan. Got grade school kiddos? Get something spacious and versatile–yes, we mean minivan. Have older kids to lug around? Consider a large, sturdy SUV. Where you live: If you’re in a colder climate (*cough cough Manitoba*) you’ll want four-wheel or all-weel drive. What roads you’ll be driving on: Mostly city streets? Opt for something smaller and more maneuverable. Going cross-country? You might want something bigger and more comfortable, with road-trip stuff like cruise control and a DVD player to keep the kids quiet. Whether you need towing capacity: If so, make sure to get a V6 engine. Your income: Do you need to buy a cheaper vehicle? One with stellar gas mileage? Your storage needs: If you’ll be dragging around strollers, sports gear, or other bulky items, make sure you make room for them too. Still not sure what sort of family cars to look for? 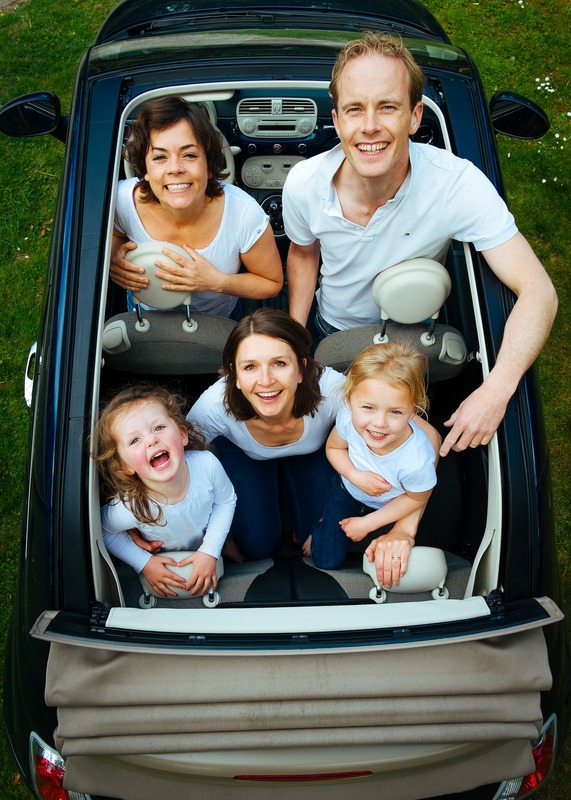 Take this fun quiz from Parents to see what kind of car is best for your fam. When you’ve got an idea of the family car you want, whip out the laptop and make a visit to our trusty friend Google. Once you’ve done your online shopping, it’s time to take some test drives. Woo hoo! Test drives are fun. Here’s where you get to experience the vehicle’s power and handling for yourself. If you don’t like the way the car feels, stop right there. You might think that if a vehicle has awesome safety ratings and a decent price tag, you better buy it right then and there–but if it’s not your style, don’t sweat it. There are plenty of affordable cars in Winnipeg that are up your alley. We promise! Come see for yourself. At Ride Time, we’ve got lots of used vehicles that are just waiting for a family to fill them up. If you want help finding one, just ask us. We’re family guys, so we know how important it is to find a dependable car for your little youngsters (oh, and Mom and Dad too).